Today, EUSTAFOR is launching eight policy messages, a contribution on behalf of state forests to the debate on advancing the European bioeconomy. 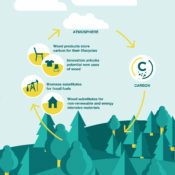 Forests cover more than 40 percent of the EU’s land area and provide the bioeconomy with renewable materials in addition to many other important ecosystem services. Moreover, EUSTAFOR members – European State Forest Management Organizations – perceive themselves as catalyzers of the bioeconomic development in European countries and regions due to their scale, stability and commitment to sustainable forest management. On 16 November 2017, the European Commission launched its review of the EU Bioeconomy Strategy, which reports on the role of the bioeconomy in research and innovation and within the context of EU policy. EUSTAFOR is contributing 8 policy messages geared towards achieving an ambitious update of the strategy. The messages are available at this link. More information on the same topic can be found in EUSTAFOR’s brochure: “State Forests Boost the Bioeconomy,” which is available at this link.